If you're a keen cook with big culinary ambition, a small kitchen could stand between you and gourmet greatness. With little room to unleash your full gastro potential, not to mention store those all-important pots and pans, that cramped space could put a damper on your kitchen creativity — making it hard to cook up a storm and spend extra time in, arguably, the most important room of the home. But, however small your kitchen, its dimensions needn't stop you from getting your cook on. 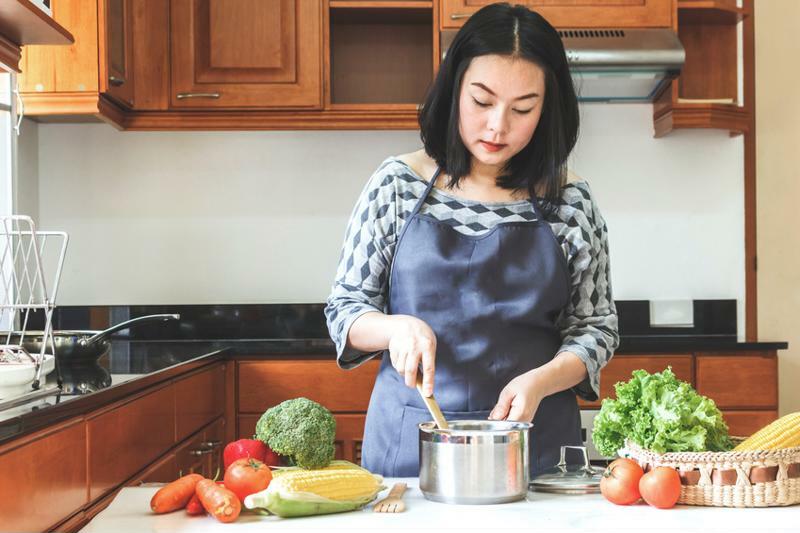 There are lots of things you can do to expand the prep, cook and storage space of your kitchen, and reclaim usable surfaces that can make all the difference to your cooking habits. Here, we list 8 ways to find extra storage space in a small kitchen. With limited cupboard space, your only option in a small kitchen is to get creative with storage solutions. The easiest way to add extra storage is by installing a wall rail or rack which lets you hang pots, pans and other bulky utensils. Such items take up a lot of space in the cupboard, so it's better to hang them on the wall. They'll also be easier to access from this position, so no time is wasted rummaging through drawers and cupboards for the right piece of kit. If you've got lots of pots and pans, consider hanging more than one rail to exploit the vertical space in your tiny kitchen. Some kitchens have a fake drawer front under the sink, but few households make use of the space this provides. While a full drawer couldn't be installed because of the sink basin, these drawer fronts can be hacked for extra storage space — albeit with a little DIY know-how. By removing the drawer front and installing a simple hinge on the bottom, you can transform those space-stealing fake drawers into a clever storage solution. Screw a small tray onto the inside of the drawer front, and use it to store things like scouring pads, cloths and washing up liquid. This guide can show you how. Fake drawers can be very effective. If you're keen to exploit every inch of available space in the kitchen, consider using the back panel of your cupboard doors to store essential items and ingredients. By screwing small hooks into the reverse of the door, or else installing a small shelf or basket, you can store thin and small items, like herbs and spices, without impeding on internal cupboard space. While storing small items on the back of cupboard doors might seem like more hassle than it's worth, the extra space you'll create in the cupboards will be sizeable, and will help to keep the kitchen more organised. Provided you aren't living in a rented property (we don't think your landlord would take kindly to you drilling into the kitchen cupboards) it's a good idea to add small shelves to the side of exposed kitchen cabinets. 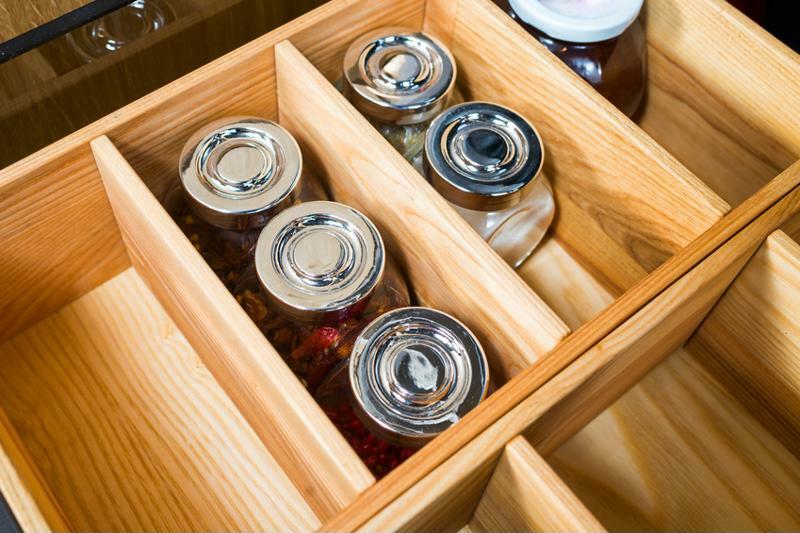 This clever kitchen storage hack will give you added space for storing small ingredients and utensils, and is particularly useful for storing essential items that you need during everyday cooking and other kitchen tasks. Storage options are available in even the smallest spaces. Most people store food, crockery and utensils in their kitchen cupboards without thinking about how the space can be optimised. Normally, kitchen cupboards contain one or two shelves, but these might not let you take total advantage of the space — particularly when storing certain food items. Rather than relying on the default setup of your kitchen cupboards, consider buying and installing additional cupboard shelf systems that allow you to make better use of the space. A lazy Susan is great for corner cupboards, whilst rolling cabinet fixtures can let you store items even in those hard-to-reach corners. Experiment with different cupboard shelving options, and you'll enjoy a more organised and spacious kitchen. In a small kitchen, worktop space is at a premium; so don't waste it storing bulky items on your counter unnecessarily. Knife blocks, bread bins and other storage tools might be the obvious choice, but they aren't the most space-efficient solution for small kitchens. While it's great to have knives and other utensils at arm's reach, there are better ways to store such items than a standard knife block or utensil rack. One of the best options for storing essential kitchen tools is a magnetic knife strip, which simply hangs on your kitchen backsplash, making it easy to store knives and other metal utensils within easy reach — and without using precious worktop space. And as for bread and other perishable foodstuffs which are often stored on the worktop, why not use a FoodSaver Vacuum System to seal these items and pop them in the fridge or freezer. With guaranteed protection against freezer burn, this is the perfect way to preserve the freshness of everyday kitchen foodstuffs. Make a small space work for you. While fridges have traditionally been adorned with novelty magnets brought back from family holidays, there are now several handy magnets out there that are specifically designed to boost the storage potential of small kitchens. From small storage boxes to complete spice racks, you can stick a range of things on your fridge using these clever magnets — boosting the vertical storage space of your kitchen and making it easy to access those everyday kitchen essentials. If you've optimised your cupboard space, installed wall racks for your pots and pans, got rid of worktop clutter and are still lacking in space, why not invest in a rolling cart for flexible, extra storage? Narrow kitchen carts can be bought reasonably cheaply, and can stand next to your existing cupboard, giving you plenty of additional shelved storage space. The great thing about a wheeled kitchen caddy is that it can be moved around the kitchen, providing flexible storage that's great for budding chefs who like their pantry ingredients close by. For even more space in your kitchen, you can count on FoodSaver. Our innovative vacuum sealing system allows you to keep your fridge, freezer and cupboards organised and compact, so you can enjoy more space whilst keeping your food fresh. To find out more, visit the homepage or call us on 0800 525 089.